Presented as part of “Chelsea Knight: Fall to Earth,” a project of the R&D Season: SPECULATION. 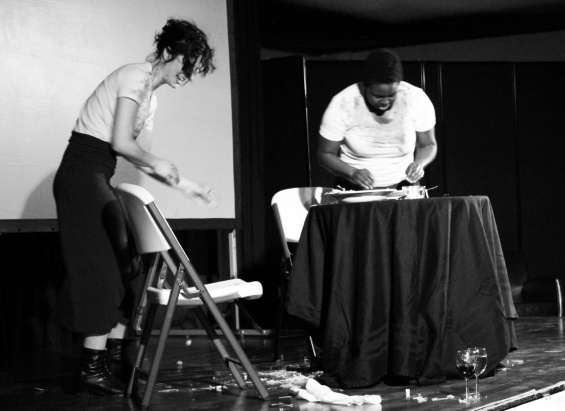 Knight + Knight Latencies is a performance that is part lecture, part dinner party, and part therapy session, in which two female artists who share the same last name examine their symmetries and, in the process, some fundamentals around feminism and race. It was originally shown at the historic 1939 Eldorado Ballroom in Houston, Texas, on January 24, 2015, and was co-commissioned by Project Row Houses and DiverseWorks. Chelsea Knight received her BA from Oberlin College and her MFA from the School of the Art Institute of Chicago. Knight recently completed residencies at the Whitney Independent Study Program, the Skowhegan School of Painting and Sculpture, and the Lower Manhattan Cultural Council Workspace program. She has had solo exhibitions and performances at the Brooklyn Museum; the St. Louis Art Museum; Aspect Ratio Projects, Chicago; DiverseWorks, Houston (with Mark Tribe); Abrons Art Center, New York; and Momenta Art, Brooklyn. She has also exhibited her work in group shows, including “Nouvelles vagues,” Palais de Tokyo, Paris; “Anti-Establishment,” Hessel Museum of Art, CCS Bard, Annandale-on-Hudson, NY; and the Young Artists Biennial, Bucharest. Autumn Knight is a Houston-based interdisciplinary artist. Knight’s work primarily falls within the rubric of performance, installation, and social practices that address conventions of racial and gender identity, psychotherapy, and art access. Knight’s performance work has been in group exhibitions at various institutions, including the University Museum at Texas Southern University, Houston; DiverseWorks, Houston; Art League Houston; Project Row Houses, Houston; and Blaffer Art Museum, Houston. She was a 2013–14 artist-in-residence at Galveston Artist Residency, Texas, and an international artist-in-residence at In-Situ, Pendle, UK. She has an MA in Drama Therapy from New York University and a BA in Theatre Arts from Dillard University.